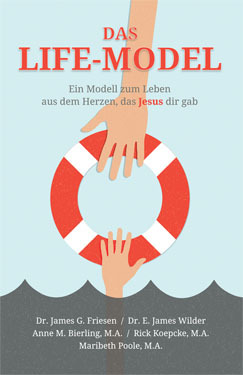 Das Life-Model: Ein Modell zum Leben aus dem Herzen, das Jesus dir gab is the German translation of the Life Model, Living from the Heart Jesus Gave You. The Life Model is a unifying approach to ministries of counseling, recovery, pastoral care, prayer ministry, delivereance, inner healing, child rearing, body life and health. Substance abuse recovery programs internationally are guided by the Life Model's five principles. Because the Life Model develops strong maturity, it is widely used as a church model, particularly where people must face suffering. Missions have adopted the Life Model for restoring hurt missionary children. Almost every major ministry dealing with trauma and abuse in the USA uses the Life Model as part of their teaching. Written by James Friesen, E James Wilder, Anne Bierling, Rick Koepcke, and Maribeth Poole. To order, please choose the source that is best for your location.